A delay in diagnosis of a fracture can result in significant pain and suffering. The sound of a body hitting the floor can bring healthcare providers running. When the sound occurs when a nurse or aide drops a patient during transfer, the next sound may be, “Oh no.” This type of fall may occur if the staff does not use proper body mechanics, the patient is uncooperative, or the transfer requires more people that were actually used for the procedures. Taking shortcuts, cutting corners, and being rushed can spell disaster. The result may be a fracture, a head injury, paralysis, and death. The situation is worsened when the staff member involved does not report what happened. What drives the urge to cover up? Fear, guilt, and desperation may push the facts underground. In one case, two aides dropped a patient while transferring her into a Hoyer (hydraulic) lift. The patient suffered two fractured hips. The aides did not tell anyone for fear they’d lose their jobs. In another case, an aide tried to transfer a patient from a bed to a wheelchair, and the patient fell, fracturing her leg. The aide did not tell anyone what happened. Subsequent nursing staff observed the patient crying in pain, and the truth came out. In a third case, the fact that a woman’s leg was fractured became evident when her broken bone eroded through her skin. In the absence of any documentation to explain how the fracture occurred, the defense may assert the fracture was a spontaneous one. This theory is based on the concept that bones may become brittle and fracture on their own. This is certainly true of patients who have cancer, hypoparathyroidism, Paget’s disease, and severe osteoporosis. However, spontaneous fractures of the hips are rare, and should stimulate a suspicion of trauma. The facility administrators need to perform an investigation to talk to the nursing staff involved in caring for the patient before the symptoms of the fracture were detected. 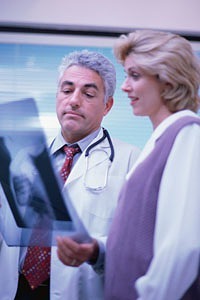 An orthopedic surgeon and radiologist should review the x-rays to look for evidence of bone disease. The healthcare facilities need always be concerned that staff have adequate equipment and help to safely move patients. In most cases, insurance companies will get out their checkbooks. These cases are usually indefensible. Learn more about falls by checking out this value pack. Med League provides expert witness for Pain and suffering (also called Federal Rule of evidence 1006) cases or other types of healthcare experts. Call us for assistance.